Corners are generally the most ignored spaces in the house. But a lot can be done to make these idle places more functional and beautiful – adding innovative mini-drop zones, cozy book nooks, converting them into play areas for kids and so much more. Here are 5 creative ideas to transform your dull corners into charming little spaces. An unusual corner is the best place to create a small in-house library. Corner shelves are also a great solution for adding storage space. Stack up all your books, place a comfortable chair (preferably a foldable chair) or a bean bag along with a floor lamp, and convert your empty corner space into something more majestic – a book lover’s haven. Add a few of bright cushions and a warm blanket next to your chair/bean bag for times when you fall asleep reading your favorite book. 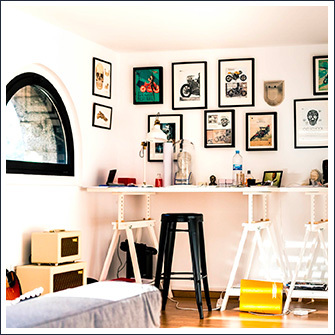 Transform your living room corner walls into art areas. Cover them with beautiful paintings, family pictures or hand-made drawings of different sizes. Simple aesthetic frames are also a good option. A nice piece of old-school chair and a pretty-looking cushion can also be an excellent addition to the space. Alternatively, you can hang few pendent lamps from the ceiling that will highlight your paintings. A wall of art helps in adding a touch of sophistication to a space. This is one of the best creative ideas for corner decoration, especially for small houses. Place a writing table-chair set and make your dull corner area a highly useful zone. Consider a triangle-shaped small table for the space. You can also beautify the area by adding a pendant or floor lamp. Consider placing a cabinet or wall bookshelves installed above the table to stack your collection. A creative writing corner can give any space an antique, artistic look. Dedicated corner play areas for kids make for innovative ideas in home decoration. It’s an excellent way to keep your little ones from loitering around. Cover your corner space with a muted tone carpet and place a chest of drawers to store their books and toys. This way you can convert your quiet corner into a playful space and stop your kids from messing around the house as well. A color board where your kids can show their talent can also be a great addition to the space. If you do not wish to innovate much, you can let your corner spaces remain simple and elegant by placing an old table and dressing it up with some quirky antiques. As an alternative, place a few notepads, a pen holder and a landline phone for noting messages. You can also have a sleek floor shelf installed in the corner and decorate it with artifacts. 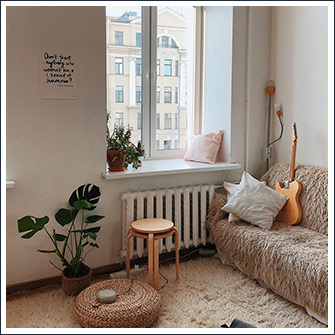 To conclude, you do not have to buy expensive antiques or furniture to add charm to your empty corner spaces, just implement some creative home decoration ideas to make the areas look beautiful and functional. Just make sure that whatever you do, it reflects your taste in your home décor.